Cookie decorating is a hobby I thoroughly enjoy! But the activity of baking and decorating cookies can be quite time intensive. If I am going to spend several hours decorating special cookies, I think it’s worth a little extra time and investment to package them in a way that really shows them off! 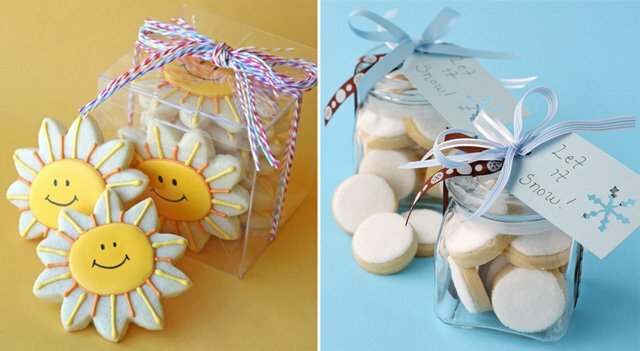 Some thoughtful packaging can turn a few small cookies into a really beautiful gift. I often package cookies in cellophane bags, as I’ve shown HERE and HERE, but today I wanted to share a few other options. I’ve included links to each of the different elements I’ve used, and I hope these ideas will spark a few of your own as well! (Above, left)- Mini cookies in an 8 oz. mason jar (I usually buy the jars at Wal-Mart, but there are several on-line sources, such as Kerr, The Jar Store, or Specialty Bottle). I used a cupcake liner (flatten slightly with my fingers first) on top of the jar lid, then screwed on the jar ring. (middle)- Mini cookies in small red gable boxes (similar available from Kara’s Party Ideas), finished with paper ribbon from Paper Jacks, and a free printable label from Shindig Parties (as featured on Lil Luna). (right)- Mini cookies in a small jar (from Wal-Mart), finished with bakers twine (from The Twinery). (Above)- Cookies in cookie boxes from BRP Box Shop. I was happy to be included as a “cookie expert” to help advise BRP in designing boxes just for cookies. The end results are boxes that I think you’ll find lots of uses for! The box shown above is the 7″x 4 1/2 ” size, perfect for a small gift. Normally, I would put the cookies in small clear bags before arranging them in the box, but if the cookies are going to be enjoyed right away, then laying them directly in the box (on some crinkle paper) should be fine. (Above, left & right)- Mini cookies in 8oz. mason jars (as described in an above photo). (middle)- Mini cookies in a polka-dot favor box (from Shop Sweet Lulu). 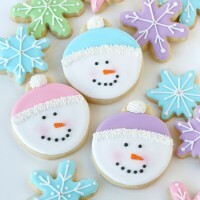 (Above)- These cookies are from previous post, Smiling Sunshine Cookies, in a box (from Garnish), and Easy Snowball Cookies, in a jar (from Wal-Mart). 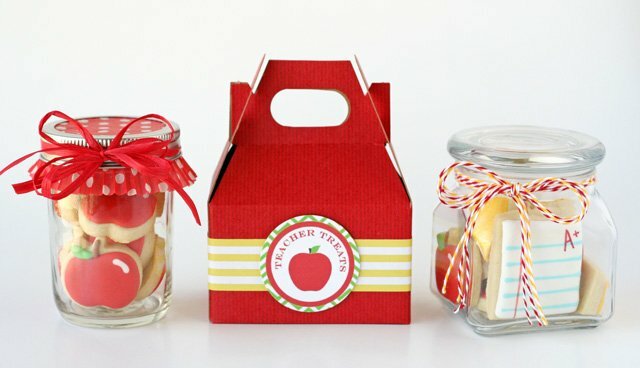 And these Apple Cookies in a Jar from Sweet Sugar Belle are just so cute! these are really super cute! those are all so cute, but the cupcake liner trick is so great, cannot wait to try that. These are so adorable. You’re so crafty! Oh my gosh . . . just to cute for words!!! love these ideas! 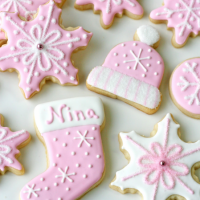 i’m always looking for cute ways to package homemade gifts, especially decorated cookies! the BRP boxes are great- never would have thought to use something like that. i’ve done the mason jar and it’s always a big hit; i’ll have to try the cupcake liner, it’s so adorable! i’ve also stacked cookies into one of those clear plastic mini-paint cans you get at michaels… thanks for the inspiration! The creativity of the packaging is wonderful. So pretty. I love the cupcake liner idea. It’s the perfect size!! I love your cookies and their packaging.! 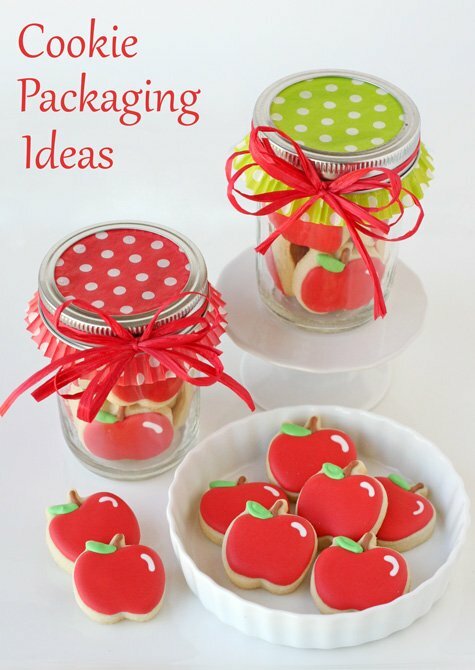 Your packaging ideas are as cute and as enticing as all your decorated cookies. You said in your post that you would normally put the cookies in “small clear bags” before placing them in the box unless of course they were used right away. Where would you purchase the bags and what type do you use?? Thanks so much for taking the time to answer. This post has inspired me to be even more creative for the “Country Store” item I will be baking for our churches Labor Day Picnic. Can’t wait to get started! Mary, For small cookies, I usually put one or two cookies in a small, 4″x6″ size bag you should be able to find in the baking section of either Michael’s or Hobby Lobby. For larger cookies, you may need to use a bit larger bag (such as a 4″x9″), so you have room to fold the bag over a time or two. I seal the bag with a small round sticker, such as a 1″ round envelope type seal (from the office supply store). So glad you’re feeling inspired! Happy Packaging! I have so many cupcake liners; what a perfectly cute idea! Absolutely Adorable. I have a question. I know you need to let the cookies thoroughly dry before packaging (you mention eight hours for one). How long do the cookies stay fresh and edible? Thanks! Elanie, If you’re using the same recipe I use, the cookies will stay fresh and delicious about a week. They will be quite good even longer (up to two weeks), but will begin to dry out a bit. Absolutely adorable and inspiring Glory! I LOVE these! Ya know I love all of them! Ahhh- the packaging! My fav part! Yes, you always do such a beautiful job with your packaging Jackie! I love your packaging!! Cupcake liner! You’re a genius! I’ve always wanted to try the mini-jars, but…if you are packaging in jars or gable boxes, how do you keep the oil from the back of a cookie from leaching onto (and then ruining) the icing on another cookie.? I usually package the cookies just before I plan to give them away. At that point, the cookies may be 1-3 days “old”, meaning they have had time to dry just a bit and are not overly oily. Bottom line is, it’s possible some of the cookies may pick up a bit of oil. Depending on how you layer them in the jar (or box), most of the cookies should be perfect. Love the beautiful packaging..and all the pretty treats inside! Thanks for such wonderful ideas. these are lovely ideas. i will use it to make gifts for our new year in 3 weeks! anyway, i love it and use it!!! These are wonderful! I especially love the sunflower cookies, and the back to school cookie boxes! They are works of happy art! Congratulations! I love your web! All you do is so fantastic and inspirate me. Such a cute idea. 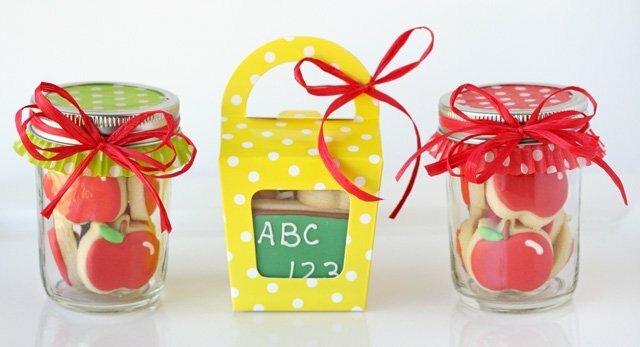 I would like to make mason jars like these for teachers appreciation for my kids teachers. Is this a regular size cupcake liner or jumbo. I’ve tried the standard ones and they don’t hang over the edge like yours do. Where do you buy your liners from? Thanks! Beautiful work, they all look so good I would feel truly spoiled to receive such a gift! Just wondering how the cookies in the box work? Do you ‘fix’ them in the box in some way so they don’t move about? Or do you pack in enough so they stabilise that way? Thanks! Hi Arlene, For the cookies in a box I add a layer of paper shred and add the (individually bagged) cookies on top. The shred gives a nice cushion so you can press the lid down and the lid holds them in place pretty well. If I were to ship the cookies in these boxes I would likely add one layer of bubble wrap on top of the cookies before closing the lid. such inspiring ideas. Thanks so much for sharing. My question is regarding the mason jars. How many cookies do each size hold? I make these amazing (I’ve been told) chocolate chip cookies. I want to use your packaging idea with the masonary jars. I love it. From your experience do you know how many cookies fit in each size? thanks again for sharing. If you have a newsletter I would love to follow all you do. I don’t find the browser box you have showing on the left side on the browser website ??? I would like to pack cookies (12) a dozen in the box . what size box will fit the cookies.? Also what size box will fit 12 cake pops? BRP Box Shop has lots of different box sizes, and all have the dimensions listed. Feel free to browse their site for what you need.